Keith Rohr: Usually an easier Monday and Tuesday followed by a more aggressive Wednesday and Thursday then easier Friday and Saturday. My off the bike training usually includes some running with sprints as well as upper body weight training and core work. What is your normal race day routine? Walk us through your day once you arrive at a venue. Joe Dombrowski: I like to arrive early to the venue. This gives me a chance to support teammates in earlier races, and scope out the course off the bike. Jay Morali: I eat 3 hours before the race. I ride the course as soon as I arrive and then warm-up on the road 20 minutes prior to the start. Pop a powergel and race! Lenore Pipes: I usually get on the course and practice the sections I find tricky. Then I say hey to all of my buddies. I do a few zone 4b efforts and then I go to staging. Fuentes opening up a big lead. Dave Fuentes: I like to pre ride the course ASAP and pick the sections that I feel will be tricky, look at the obstacles and general course lay out. I’ll start riding about 2-3 hrs before the race. I like to hit the line sweaty and ready to go. The races usually start very quickly, then settle down, so my warm up is the most important part of the race. I’m also thinking about my road season, so I make sure to get the most out of a day on the bike. Keith Rohr: Get to the course two hours before the race start. Pre-ride the course a bit. Get registered. Drink some water. Sip a RockShot and eat a half of a banana. Warm up with some hard efforts to spike my pulse a bit. Get to the line early. Becky Frederick: It was nice Sunday to get a few laps in without worrying about getting my drive train mucked up. I took two laps, re-riding a few places to try all the available lines. Before my own race, I warmed up on the trainer at the car while yelling loudly as guys went up the start hill. Typically I will try to get on the course an hour and a half before my start to ride a few very easy laps, and finish my warm up on the trainer. What was your favorite part of the course, what could you have done without? Joe Dombrowski: My favorite part of the course had to be the back section with the steep rises and bermed turns; you could pump the bike for speed. My least favorite part (except for the killer crowd!) had to be the barriers. They were very awkward to me; however, I think that was the general consensus among most racers. Jay Morali: I loved the section near the barriers when you rode by the spectators. It was amazing hearing all the cheers. I felt like I was racing in Belgium! Lenore Pipes: I love paved roads. Dave Fuentes: I liked everything on the course. It was not too muddy, there were some long road sections and it was windy. I could have done without crashing twice on the first lap. Keith Rohr: I liked the finishing straight and the descent to the barriers – lots of people screaming. I could have done without the hard roots before the finishing straight. Becky Frederick: I loved the sweeping turns on the backside – especially those with a few roots thrown in for good measure. And the barriers. And the turns right after the start hill. Yeah, so pretty much all of it. Except the soft ground by the food tents and the headwind out along the golf course … but what a great course! Mike Birner: I loved the barrier section with all the crazy spectators. It was a rush to roll through there each lap. I guess some people weren’t crazy about the turn on the bricks? I started to wash out once and saved it but heard others laid it down there. If it had been wet it would have been tricky. What was your race strategy? Did it play out the way you thought it would? Joe Dombrowski: There was a lot of pavement in the race so I wanted to try and sit on as much as possible. Besides that, it was just go fast. I figured that DeWald would be hard to beat, especially on that course, in those conditions. It seems he can really fly on the fast courses. For the most part, the race played out as I thought it would. Jay Morali: I knew it would be important to be near the front once we hit the flat windy section on the backside. It did turn out to be a pivotal point in the race. Lenore Pipes: My strategy was to follow Arley but she gapped me pretty hard the first time after the barriers. She is just too smooth for me. Dave Fuentes: No real strategy to speak of. Each race is different, and things can change very quickly. I didn’t think the race would split up as quickly as it did. I was assuming that there would be a lead group of about 4-5 riders and would play out from there. Keith Rohr: A $50 prime was announced at the beginning of the race, so I was aiming for that and won that. I figured I would see how I felt after that and try to attack as much as possible particularly on the open road. Turns out, I pulled way too much doing too much work. That let Jay Morali slip away and Neal Sapp pulled away just before the finish, so I finished 3rd. My legs felt lousy the whole race, so I can’t be too upset about it. Becky Frederick: I wanted to put my best race out there and hope that it all worked out. I found some places for recovery and really had fun with the turns. Mike Birner: Get to the front early and stay out of trouble. Since I’m not a big power rider I wanted to make sure I had some help in the headwind section and didn’t want to be caught out alone through there. It worked out well as we had a good group that gapped the others. Walk us through the decisive moment(s) in your race. Joe Dombrowski: Looking back, it was when Ryan opened up the gap. He ramped it up on the slightly uphill road section after the pit, and slowly extended his advantage over the last couple laps. I think it may have paid to be more vigilant on that road section. Jay Morali: I sensed a slowing of the pace on the last lap. Neal Sapp was on the front and had been riding strong all race. Keith Rohr was there after closing a small gap. I jumped out of the saddle and quickly got a small gap. With the windy, flat section near I knew I had to make a decision…can I take this all the way to the house on my own? Will Neal and Keith ride together and chase me down leaving me exhausted for the sprint finish? My answer came to me in the form of a crash by Neal. As he chased, he came around a muddy corner too fast and slid out dropping his chain in the process. I had only one option…ride as hard as I can! I was able to navigate all technical areas and avoid any major mistakes on my way end. Lenore Pipes: Once Arley gapped me after the barriers, I tried to get a chase group started. I almost got dropped from that group after the barriers again so I decided that I should be leading through that section. I pulled on the pavement on the backside with only Julie responding but we were never able to bring Arley back. I attacked pretty hard to avoid the sprint finish but Julie is just so strong. Dave Fuentes: I think the race was all said and done by the second lap. Chris Nystrom crashed about half way around the first lap and I was right behind him. We were tangled up a bit, and it took a while to separate. By the time I started going again, there was a lead group of about 6 riders already with a gap. I had so much adrenaline going that I caught them by the start of the second lap. I saw that they were not going very fast so I started attacking right away. Eventually there was only 1 rider left. He finally popped on the 3rd or 4th lap. Keith Rohr: With 2 to go Morali, Sapp, and I were together, but Morali put the power down and drifted away from us. Sapp threw his chain and Morali got away. Sapp caught up to me and we thought we could catch him, but he was gone for good. Becky Frederick: I had a good start and the hole shot, which I had figured would be important with the potential for traffic jams as we hit the grass. Later in the first lap, I let Misty by just after the pits so that she wasn’t drafting me and she took off, not to be seen again until the podium. Natalie and Christine were always within sight behind me, keeping me on my game. Mike Birner: I had to make a choice when Fuentes caught back on and attacked whether or not I would try to hang on for as long as possible. I was already in the red and knew I couldn’t hold that pace and would have paid the price later in the race. Samuels went with him, I didn’t and I think he later blew from the effort – but did a great job of hanging on for second. Had we been more organized we might have been able to catch second place as he was slowly coming back to us. What are your goals for the CX season? At this point, do you think you are on track to meet them? Joe Dombrowski: I turned 18 this year, which makes me a first year U 23. That sort of puts me at the bottom of the totem pole at the national level. I hope to have a good ride at the Mercer USGP and U-23 nationals, and maybe spend time in Belgium again this year racing at Geoff Proctor’s pre-Worlds camp. I feel that I was able to draw a lot from my first season racing ‘cross last year, and have adapted my training accordingly with more training specific to the demands of cyclocross racing. I think that this will put me on a better track to perform well in the November and December races as I hope for. Jay Morali: My goals for the season were to win a race and compete for the overall series lead in the 3/4 35+ category. Lenore Pipes: My goals for this season were to get a few results so that I can get on a team next year. Dave Fuentes: My goal was to do better that I did last year. I think I achieved that so I guess that means I’m on track. Keith Rohr: I was hoping to have a few wins under my belt at this point and permanently upgrade to the Elite Master’s, but I’ve been missing the mark on several occasions. I’m still confident I can win a few races at the B Master’s level and stay mid-pack or stronger in the Elite Master’s races. I’d like to finish the season as the points leader in B Master’s. Becky Frederick: I didn’t write down any goals until a month into the season. Most of them are actually training related – staying motivated during November when the training isn’t as much fun as the racing. Joe Dombrowski: Thanks to Mom, Dad and Haymarket Bicycles. Lenore Pipes: I’d like to thank the promoters for giving equal payout to men and women. I’d like to thank Hardy from the C3 team for pitting Jordan’s bike for me. And I’d like to thank Jordan for giving me his bike to put in the pit even though our pedal systems are not compatible. I’d like to thank Elite Bicycles of Philadelphia for always helping me get my bike race ready. I’d like to thank Echappe Equipment for letting me race on Revolution Wheelworks Rev-50s. Dave Fuentes: Big props to all the people who were able to pull off another great race. It’s not easy and I know the racing community really appreciates it. DCCX has a great spot and I hope they continue to promote a stellar MABRA event. I also like to thank everyone at The Bike Lane in Reston Town Center. I’m always having issues with one thing or another, and they are always very accommodating and keep me rolling. 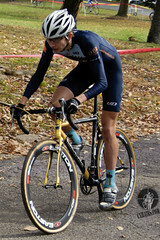 Keith Rohr: Thanks to my TMR and AFC buddies who were cheering me on at DCCX. I heard you and I promise I’m gonna’ deliver sooner or later. It’ll probably be when my wife actually shows to one of my races [laughs]. Thanks to my lucky charm, Avy, my daughter, she is my biggest fan. Becky Frederick: To ALL the ladies that showed up. The energy of a big field (44 cat 4 starters!!) is contagious and I have a ton of respect for everyone that’s working hard to be out there racing their own race. Mike Birner: Of course, as always – Ben at Ben’s Performance Bikes for his continued support and also to DCMTB for another great race this year. November 6, 2009 November 6, 2009 Leave a commentArmed Forces Retirement Home, Becky Frederick, CX, cxhairs, cxhairs.com, cyclocross, Dave Fuentes, dccx, dcmtb, Jay Morali, Joe Dombrowski, Keith Rohr, lenore pipes, MABRA, Mike Birner, Washington D.C.